Are You Looking For A Minivan? Often, the exterior features of a vehicle are what grabs your attention and cause you to take a closer look at what it has to offer. The 2018 Dodge Grand Caravan does just that by incorporating a set of exterior features that many drivers will enjoy and find beneficial. The is much to admire about the 2018 Dodge Grand Caravan. First up is the deeply tinted sunscreen glass. This feature will help to keep both you and your passengers cool and comfortable by blocking out the sun as you make your way around town. The 2018 Grand Caravan also comes with power sliding doors and an available power liftgate. This allows you to move passengers and cargo in and out more freely. 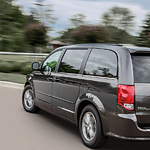 If you would like to learn more about the 2018 Dodge Grand Caravan and what it has to offer, then make your way to our showroom at Leckner Chrysler Dodge Jeep Ram for answers and a test drive.